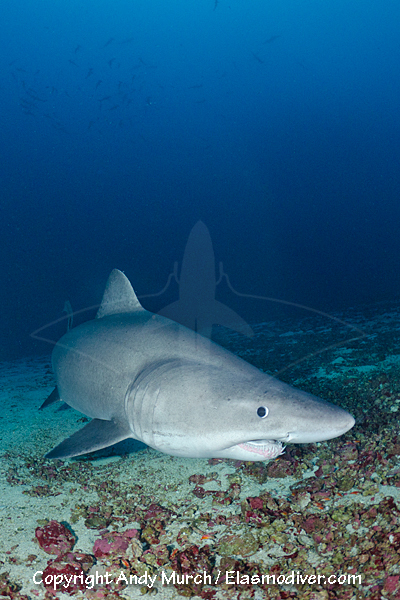 Diving with Smalltooth Sandtiger Sharks at Malpelo Island, Colombia. First published in Diver Magazine Volume 38, Number 6. It was a wonderful sensation hanging in the warm blue water, one hand clutching my deco reel, the other cradling the camera that held my first precious images of a shark few divers have had the opportunity to encounter. I thumbed through the short sequence of pictures again, incase the whole experience had been a nitrogen-induced illusion. There it was, just as I had seen it twenty minutes earlier below the brain numbing thermocline at Bajo del Monstruo (Seamount of Monsters). Zooming in as far as my review screen would allow, the shark’s brisling teeth and coal black eye appeared to be more or less in focus. Its powerful jaw and stocky 3m long torso dominated the lower third of the scene. As a subtle contrast, I could just about make out a school of tiny scalloped hammerheads swimming across the upper reaches of the frame, mere specks, 50m above their abyssal cousin. 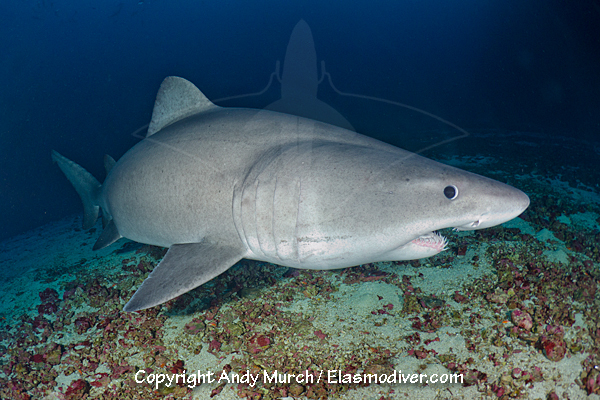 I had finally crossed the smalltooth sandtiger shark Odontaspis ferox off my shooting list. Although recorded by fishermen at numerous locations throughout it’s circum-tropical range, the smalltooth sandtiger is an exceptionally difficult animal to encounter because it spends the majority of its time at great depth. It doesn’t help that smalltooths are becoming rare due to overfishing and are now listed by the IUCN as ‘vulnerable’ to extinction. To date, I have heard of only three locations where smalltooths migrate into relatively shallow water and nowhere are encounters even remotely guaranteed. The most sporadic sightings are at El Hiero; one of the lesser known islands in the Canaries that has a reputation for some of the best diving off the west coast of Africa. According to an El Hiero Dive Master that I met at a Spanish film festival a few years ago, a few smalltooths sometimes ascend almost to the surface during the summer months. Then, they mill around for a week or two before returning to their cold water habitats like tourists at the end of their summer vacation. 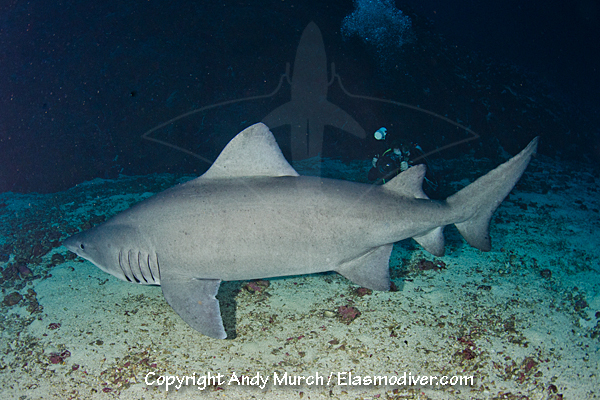 The second spot is at a dive site named Shark Point near Beirut, Lebanon. At this site during the months of July and August, you have a fairly good chance of encounters below 35m but Beirut is not every diver’s idea of a dream vacation destination. Isla Malpelo, the third and most technically challenging location due to depth and strong currents, is a mile long volcanic monolith, some 300m high, that breaks the surface about 200 miles southwest of mainland Panama. 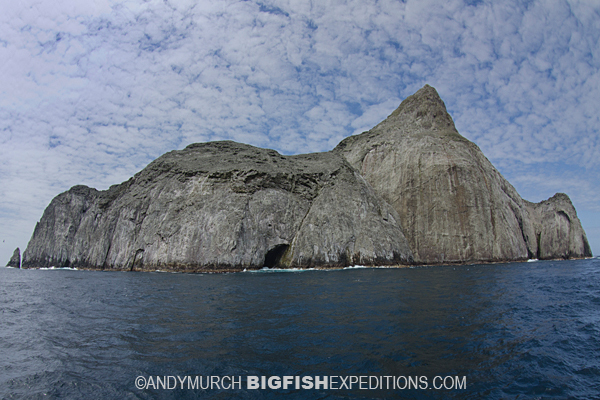 Below this inhospitable rock (which is also a hotspot for many other shark species) up to a dozen smalltooth sandtigers can sometimes be seen but only at Bajo del Monstruo; a deep reef slope on the northwest side of the island. Why smalltooth sandtigers show up at these three widely distributed spots is anybody’s guess. Perhaps the combination of icy cold upwellings and an extremely abundant supply of tropical fish plays a part, but if the sharks are there to hunt they must be doing it under the cover of darkness when divers are not watching. Not much is known about smalltooth sandtiger physiology. They belong to the family Odontaspidae which contains just two other members: the bigeye sandtiger that lives in the extreme darkness between 600 and 1000m (I’ve still got to shoot that one) and the common sandtiger, grey nurse or raggedtooth shark which is widely distributed in temperate coastal seas and is a well known species in diving circles. Smalltooth sandtigers are omnivorous in nature, consuming small fishes, squid and crustaceans which they obviously must devour in great quantities to sustain their rotund 4m long bodies. Like their shallow water ragged-toothed relatives, smalltooth sandtigers probably feed their young by oophagy; a process in which a regular supply of unfertilized eggs are pumped into the sandtiger’s paired uteruses to provide nourishment for the developing embryos. Although they are no doubt capable of sprinting when the occasion warrants it, for the most part, smalltooth sandtigers swim around very slowly and are easily approached, even if you’re carrying what looks like a big scary flashing eyeball. The trick is to make sure that your camera is completely dialed in before you descend to where the sharks are. Because of the depth of the encounters, you only have a couple of minutes to nail the shot before ascending again, and trying to figure out where the ‘ON’ button is at 65m can be a lot harder than you’d think. 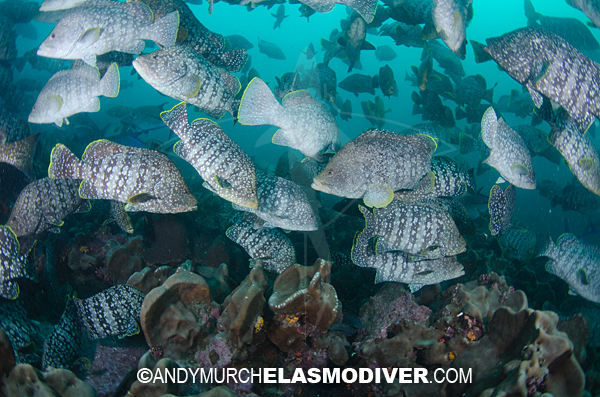 Columbian owned Isla Malpelo is the obvious place to chase smalltooth sandtigers because even if the sharks don’t show, the rest of the marine life will blow you away. 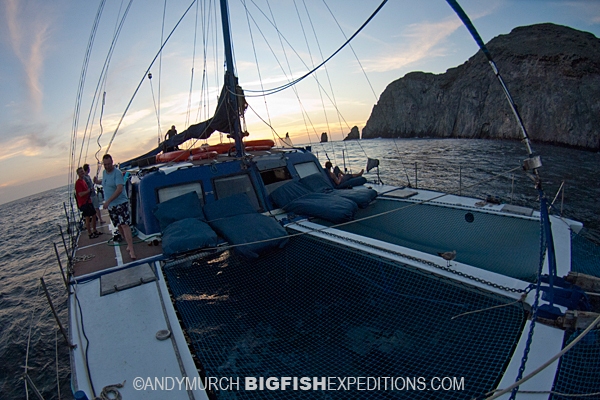 The waters around the island are practically boiling over with schools of bigeye jacks and walls of barracudas. These and other schooling fishes attract a who’s who of pelagic predators including thousands of hammerheads and Galapagos sharks. In the shallows below the island’s un-scalable cliffs, swarms of reef fishes swirl in dizzying numbers and schooling eagle rays soar past pristine hard corals while octopuses and spotted morays lounge on rocks or drift around as though no one told them that they’re supposed to be shy, reclusive creatures. Below the thermocline (which can feel like you’ve fallen into a giant slushy) the smalltooth sandtigers are the obvious draw but there are other strange apparitions to keep you entertained in the ‘narcosis zone’ such as ruby-lipped batfish that walk along the sea floor on modified fins with a look of permanent distain frozen on their scarlet lips. If you want to roll the dice with the smalltooths, they show up at Bajo del Monstruo for about two months each spring but their appearance could occur any time between late December and the end of April. Hammers are also thicker in the winter months but during the summer and fall there is a better chance to see humpbacks, mantas and whale sharks so Malpelo is worthy of multiple trips for those willing to make the effort. The 80ft dive catamaran Inula makes the 48 hour crossing from the Port of David in western Panama, stopping for a day of diving at Hannibal Bank along the way. With the potential of ferocious currents, relentless surge, challenging depths and a geographic location far beyond the range of rescue helicopters, Malpelo is not a destination for inexperienced divers or those with wobbly sea legs. But, for seasoned scubanauts that are looking for one of the last great dive spots in the eastern Pacific, Isla Malpelo not only delivers predators and prey in abundance but glimpses into a deeper world that is usually beyond our reach.